The LTTE's peace delegation led by the head of the organization's political wing, Mr.S.P.Mr.Thamilchelvan, met with the Foreign Minister of Norway, Mr. Jan Petersen, Thursday at 5 p.m. at the Royal Norwegian Foreign Ministry, sources said. The LTTE's Special Commander for Batticaloa-Ampara, Col. Karuna, was part of the delegation. The Norwegian delegation included the special peace envoy for Sri Lanka, Mr.Erik Solheim, and advisor Lisa Golden. The general secretary of the LTTE’s Peace Secretariat, Mr. Pulithevan, and the deputy head of the LTTE's Women’s political wing, Ms. Thamilvili, also took part in the meeting with the Norwegian Foreign Minister. "I am very much pleased to receive the representatives of the Tamil people in the North-East of Sri Lanka at a crucial juncture in their political journey to bring about peace" said Mr. Petersen while receiving the LTTE team. Mr. Petersen wanted to know in detail the progress made so far in formulating the Interim Administration proposals and requested Mr. Tamilchelvan to brief him on the current political situation, LTTE sources said. Mr. Thamilchelvan thanked the Minister for his interest in the peace process and the invitation he had extended to the LTTE delegation. 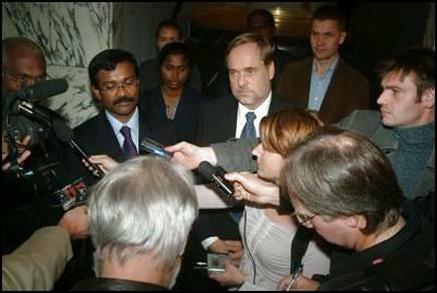 According to the sources, Mr. Thamilchelvan told Mr. Petersen that while the LTTE’s Interim Administration proposals formulated in Paris were under review by the leader of the LTTE, Mr. V. Pirapaharan, the LTTE found that certain amendments were necessary, and therefore had to conduct further deliberations with experts from the Tamil Diaspora who initially helped formulate the proposals. In their trip to Ireland, Mr. Thamilchelvan said, the LTTE was able to gather input from Intellectuals, Members of the Irish Parliament, constitutional experts with particular background in conflict resolution in Bougainville and South Africa, including members of the African National Congress. Mr. Thamilchelvan dealt at length about the conditions prevailing in the Northeast, in particular, the problems of the displaced people, the high security zones of the Sri Lanka Army, the ‘omnipresence’ of the SLA in densely populated civilian areas, the restrictions on fishing, etc. “It is only by bringing about normalcy, resettlement and creating a peaceful environment without military coercion in civilian life—by effectively implementing the ceasefire agreement—that we can build confidence in the minds of the Tamil people and thereby make them partners in the peace process,” sources quoted Mr. Thamilchelvan as saying. The international community has a “moral responsibility” to interact with the Government of Sri Lanka in bringing about normalcy in the Northeast, and if this is not done expeditiously, the peace process will face roadblocks, Mr. Thamilchelvan stressed. According to sources, Mr. Petersen expressed keen interest in the details and showed his understanding of the ground situation in the Northeast. “Norway, as the facilitator, will take all possible measures to bring about a conducive environment for the resumption of talks and the eventual resolution of the conflict,” Mr. Petersen told the LTTE delegation. Mr. Petersen will host a dinner for the LTTE delegation following the meeting. Former head of the Sri Lanka Monitoring Mission, Maj.Gen. (Retd.) Trond Furuhovde, and Astrid N. Heiberg will also attend the dinner. The LTTE delegation held discussions with the Norwegian Deputy Foreign Minister, Mr.Vidar Helgesen, in Oslo on Wednesday.